WASHINGTON — You have to give credit to Senate Majority Leader Mitch McConnell: To end last month’s government shutdown, he promised a Senate debate on immigration, especially on the hundreds of thousands of DREAMers, and the Senate is now getting it. “[F]or the first time in years, the Senate will build legislation from scratch, through the process of debates and voting on amendments,” NBC’s Leigh Ann Caldwell and Garrett Haake write. But over the last decade-plus, the problem in achieving bipartisan immigration reform hasn’t been in the Senate – which cleared legislation with more than 60 votes in 2006 and 2013, and neither process was easy. Instead, the key obstacle has been with the House, where bipartisan compromise is much more elusive. But in 2013, the Senate passed a comprehensive deal with 68 votes, and the Republican-held House never took up the legislation. The one difference between now and then is that a Republican resides in the White House, and President Trump COULD give House Republicans cover to support any deal that the Senate passes. But in addition to being all over the place when it comes to his immigration desires, Trump is backing a solution that would reduce LEGAL immigration, which Democrats and even Flake say is a non-starter. 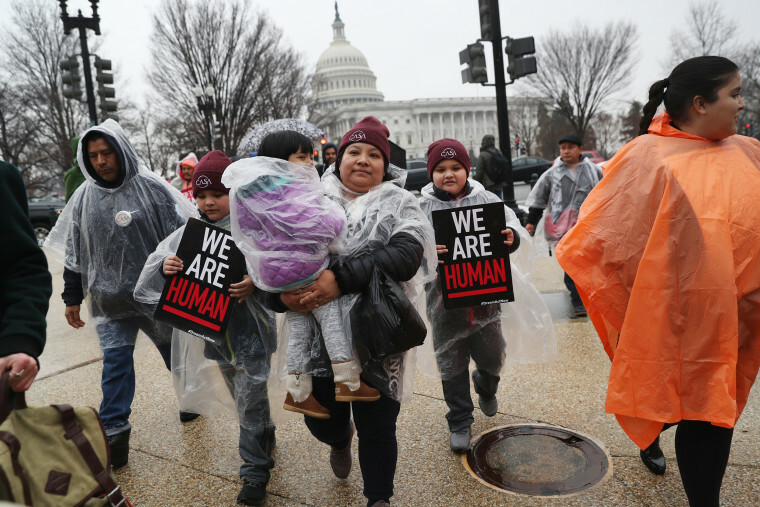 “This entire immigration debate is designed to fail, and it will,” one pessimistic Senate aide told NBC’s Caldwell and Haake, citing the 60-vote threshold as a major obstacle. Our question: Why hasn’t the House already passed its own bill that represents President Trump’s framework? It is a recognition that it can’t get a majority of votes, even in the House? "[White House counselor Kellyanne] Conway’s statements were made as she was trying to address the good wishes that President Trump sent to Rob, along with his tweets seeming to call into question the allegations and the #MeToo movement overall. Monday, White House press secretary Sarah Huckabee Sanders again declined to say whether the president believes Willoughby and me. While I cannot say I am surprised, I expected a woman to do better." Is Bob Corker re-thinking his decision to leave the Senate? To us, the real question isn’t whether Corker is having second thoughts. It’s whether Corker can win a GOP primary – given his past statements on Trump. Democrats are hoping to add to their list of red-to-blue flips in state legislative races with today’s special House election in Florida. The Sarasota-area race to replace a departing GOP lawmaker pits Democrat Margaret Good against Republican James Buchanan (the son of U.S. Rep. Vern Buchanan) and libertarian Alison Foxall. The contest has attracted national attention, with Good winning an endorsement and robocall from former vice president Joe Biden and Buchanan appearing with former Trump aide Corey Lewandowski. Trump carried the seat by about five points in 2016, but Democrats may have some serious momentum here; Good has outraised Buchannan by more than a 3-to-1 margin in the past weeks.